Last February Matt Harkins and Viviana Olen, “best friends, roommates and curators,” started a kickstarter with the goal of raising $2K in order to open a museum in the hallway of their Williamsburg apartment dedicated to Tonya Harding and Nancy Kerrigan. Like many ridiculous kickstarter ideas, theirs was roundly mocked, and highly funded (see potato salad guy) and so a temporary appointment-only museum was born in Brooklyn. This is not the first time a temporary art space has happened, nor will it be the last, but the opening of THNK1994 could be said to have signaled a tipping point in the temporary space’s legitimacy in the public eye. NY-based gallery owner Elliott Levenglick recently opened his gallery in December 2015 in L.A.’s downtown Arts District. With a focus on presenting installations in addition to exhibiting paintings sculptures and video art, the latest work being shown at the Gallery is called “Rebound” a solo exhibition by Evan Robarts. 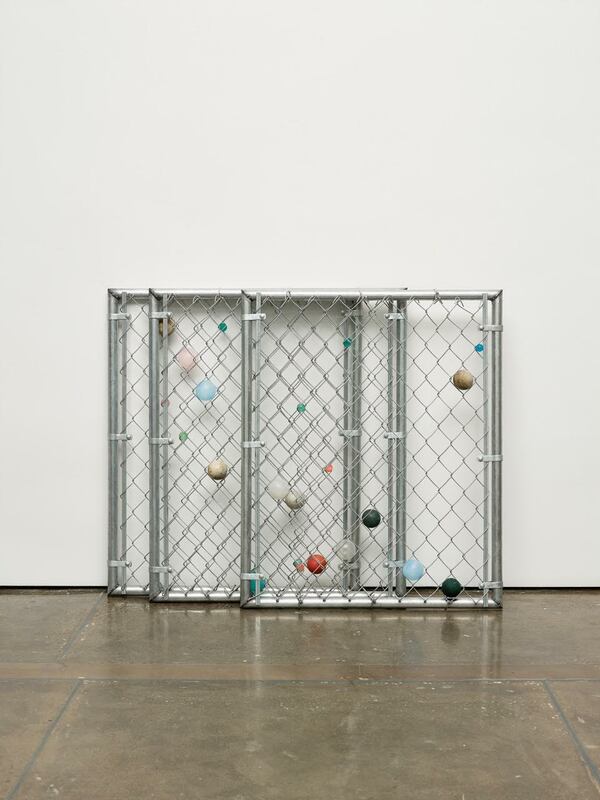 This exhibition includes ten fence pieces, the latest additions to an ongoing series Robarts began in 2013. With the name “Rebound,” Robarts’ artwork alludes to sports and the literal motion of returning. 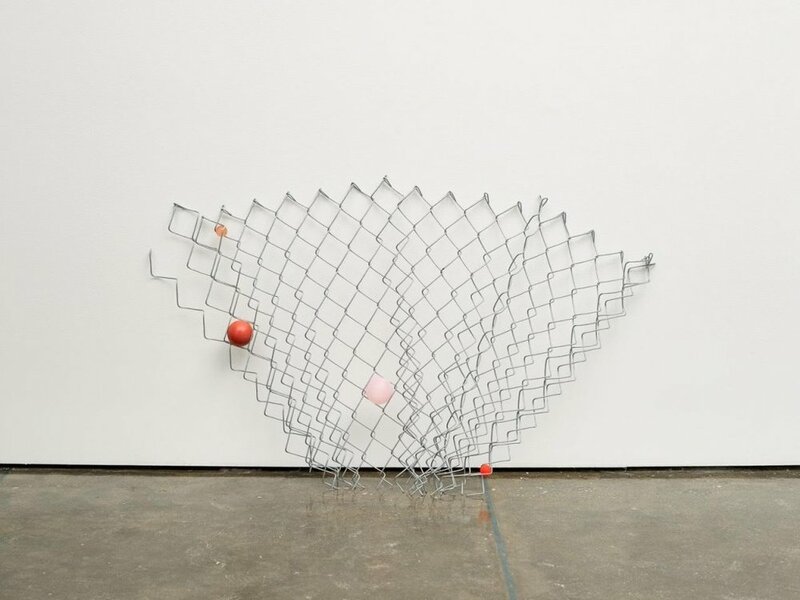 These chain-link fences involving colorful balls suspended within can be modified to stand staggered on the floor, hang like a canvas, or can be leaned up against the wall for support. We sat down with Levenglick to discuss L.A. vs New York (sorry in advance), a gallery’s purpose, and the nature of temporality. Why did you choose downtown L.A. Arts District versus anywhere else? The downtown arts district is one of the most unique parts of Los Angeles; a very up and coming neighborhood that has changed dramatically over the past few years which is now comprised of fine art galleries, hip restaurants and cafes such as Bestia and Blue Bottle Coffee and even the SoHo House (forthcoming) juxtaposed to an abundance of warehouses and loft buildings which reflects the past and the present. To be apart of this transition is really special and I am very fortunate to be around while the transformation takes place. It reminds me a bit of New York’s Chelsea and SoHo neighborhoods from the 80s and 90s before they were gentrified. In what way is the art scene different from NY to L.A.? In what ways is it the same? A major difference between both markets is the higher concentration on blue chip art in New York where as in Los Angeles some of the most unique collectors (and collections) have a focus on emerging art as well. In L.A., you can go to a big collector's home in the hills that only has emerging art displayed. That being said, with the recent openings of Hauser and Wirth, Venus over Los Angeles and the Broad Museum, one can see the taste and sophistication in L.A. beginning to rival NY. When choosing artists to feature in your gallery what is the process? I work with a lot of artists based in New York so in order to feature an artist in the gallery, studio visits are planned way in advance of a prospective show in which I will visit the artist's studio to speak with the artist and see some of their most recent work produced and collaborate on a specific theme for a show. Studio visits are some of the most exciting part of the whole process. Can you define gallery for me? What is the purpose of a gallery in your opinion? To me, a gallery acts as a physical stage that gives an artist the freedom to present a body of work to an audience. While galleries always have commercial interests in mind, I interpret a gallery akin to a museum in the sense that the space is devoted to the procurement and display of an exhibition with the sole purpose for viewing rather than to just sell. That being said, I plan on utilizing my gallery space for temporary installations that are not for sale, which is something I probably could not do in NY due to the specific style of the space. What can a roving gallery do that a stationary one can't? Vice versa? A gallery that does not have a consistent brick and mortar location has the ability to test out new neighborhoods (and markets). I have noticed several European galleries test the U.S markets with pop ups in NYC and L.A., which is great for branding and exposure for not only the gallery but also the artists being shown. Temporary/makeshift galleries like the Tonya Harding/Nancy Kerrigan gallery are big news these days, what's your opinion on that? Pop up galleries are becoming a big part of the business. Not only do temporary galleries reflect the growing presence of online platforms such as Artsy but they also underscore the increasing role social media plays in the art world today which give businesses (and galleries) the ability to market a show at an address with no previous history of exhibitions.